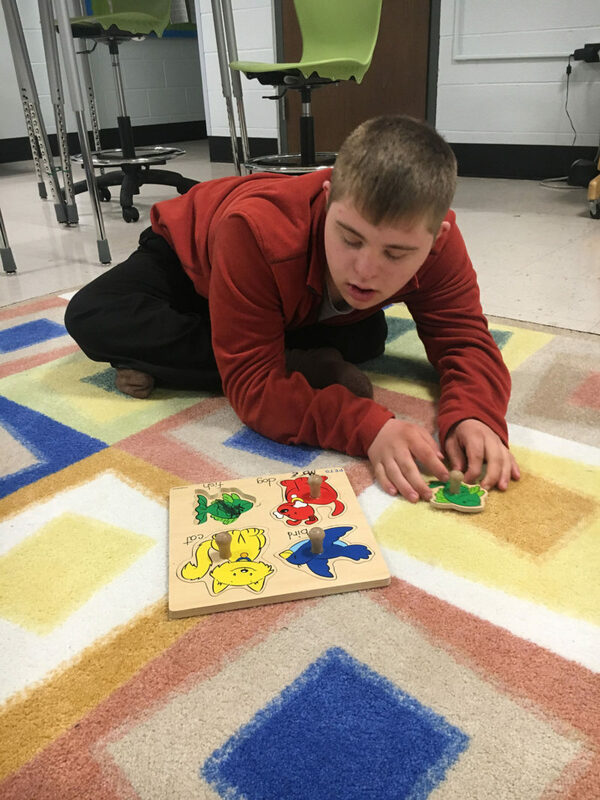 Brady LaFleur, who has autism and Down syndrome, needs a new space to accommodate him, and the school district isn’t going to find it for him. This story was produced by The Lens, a nonprofit, nonpartisan public-interest newsroom in New Orleans, and reprinted with permission. At the back of the old McDonogh 35 school on Marais Street, near the trash bins and uneven ground that fills with water after rainstorms, is a special room. The baby blue classroom has bright carpets, toys, puzzles, whiteboards and tables of varying heights. A full kitchen is equipped to teach life skills. Next door is a “cool down” room, with padded walls and floors and an observation window. The Orleans Parish school district budgeted $130,000 to build this room, records show. This year, 14-year-old Brady LaFleur, who has autism and Down Syndrome, was the only student who was using it. Here Brady learned to identify animals by completing wooden shape puzzles while sprawled on his favorite carpet. He watched Elmo videos that teach him how to sound out words. He learned social skills while interacting with his teacher — and when he put a stuffed animal in timeout. These are all things he’ll need to learn to be an independent adult one day. And it’s here that we learn what it can take to follow federal law that requires every child receive a free, appropriate education. Most students with physical or mental disabilities don’t need their own room and their own teacher. But they do require specialized services, and in New Orleans, they must find them in a system almost entirely made up of independent charters, with different curricula and teaching styles — and typically, limited resources. Brady’s family knows firsthand how hard it can be to find the right school with the right services. His mother, Erin LaFleur, said he bounced from school to home before he started coming to this room late last year. She said it was working for Brady. But the school district plans to gut the old McDonogh 35 building this summer and turn it into a career training center. Brady needs a new space to accommodate him, and the school district isn’t going to find it for him. LaFleur learned about the room accidentally. One day, in December 2016, she was at the school district’s Youth Opportunity Center, where the district helps connect students with social service agencies. It is located at the old McDonogh 35 school. She was there for a meeting about Brady’s return from Pinecrest Supports and Services Center, a state-run center for people with developmental disabilities, where he had been since the summer of 2016. He was diagnosed with bipolar disorder at Pinecrest and ended up spending five months there as doctors monitored his medication. This room exists because another family filed a complaint with the state in 2016, saying their child hadn’t gotten proper special-education services. To settle the matter, the Orleans Parish School Board agreed to build the special room. Federal law requires school districts to serve all students, including those with physical and mental disabilities. Brady had returned home from Pinecrest the day before Thanksgiving. LaFleur wanted to give him time before he went back to his elementary school, Edward Hynes Charter School. At the meeting in December, a Recovery School District staffer mentioned that a specialized room was located in the same building. The student that the room was built for was still using it at the time. Brady initially returned to Hynes in the spring of 2017 for the final two months of school. He moved from a classroom to a small resource room to a foyer near the gym. He returned to Hynes after summer break. He lasted one week. LaFleur had to fight to get a teacher sent to her house to teach Brady when he refused to go to Hynes last fall. By then, the room at the old McDonogh 35 building had become available. Brady started going there three times a week in December 2017. His special-ed teacher started meeting him there rather than at his home. LaFleur said this has helped Brady immensely because the classroom had more equipment than a teacher could bring to the house. She also thought it would provide for an easier transition back to a regular school classroom. “He made so much progress being in the space,” she said. The room’s outside access made getting there easy and lessened his anxiety, LaFleur said. Special education has been a challenge in New Orleans since Hurricane Katrina, as nearly all traditional schools have been replaced by independent charter schools. In traditional school districts, the central office is responsible for placing special education students and ensuring they receive the proper services. Depending on the students’ needs, that could range from a special education teacher joining the school’s staff to placing the student on a campus designed for a specific disability. Now the same responsibilities are divided between dozens of different public bodies. Most charter schools in New Orleans are legally considered their own school districts, civil rights attorney Eden Heilman said, which means they can’t turn any student away. But they don’t have the backing of a centralized bureaucracy. That’s not to say that things were perfect in the city’s former centralized system. New Orleans special education students’ proficiency on state tests improved three-fold in the decade after Hurricane Katrina. But a new school system presents new challenges. Just this past school year, schools in New Orleans have gotten in trouble for failing to identify students with disabilities, failing to provide required special-education services for months, and inappropriately restraining a student. Simply getting a school to figure out whether a student needs specialized help can be a challenge. Once a school suspects a child has a disability — because a parent or school employee alerts them — the school must treat the student as if he has one. Last year, a Lens reporter attended a meeting where a charter network CEO told a mother, who was asking her son’s school to perform an evaluation, that special education evaluations were expensive. He encouraged her to seek a private one to speed up the process. Hellman represented several families who sued the state Department of Education over special education in 2010. The Orleans Parish School Board intervened in the suit. The suit resulted in a consent decree that requires an outside firm to monitor the local school district and its charters. Some students can get the extra help they need while attending classes with their peers. Others need educational services in a hospital or at home. Most children get something in the middle. They’re pulled out of class a few times a week to receive services like speech therapy or adapted physical education, which is tailored to a student’s abilities, or get extra time to take exams. In some cases, students spend all day in a special education classroom with just a few other children. It all costs money. It can cost several times more to educate one student who requires his own teacher’s aide than a student at a neighboring desk who doesn’t. Large charter networks enroll thousands of students, but some single-site schools have fewer than 100. Small schools often don’t need a full-time specialist, so they look for people who will do it on a contract basis. “Some of those big, structural issues mean that schools are kind of on their own when they have a high-needs student come in the door, and they don’t have those services readily available,” Heilman said. Brady’s individual education plan, commonly called an IEP, calls for a special-education teacher and a specialist to work with him. His behavior plan advises that he needs attention at least every five minutes to avoid an outburst. One day this spring when she brought him to the room, Brady’s mom had her hair pulled back under a white baseball cap. Brady pulls at people’s hair so often that it’s noted in his behavior plan. Doctors can’t pinpoint why he does it, but if you have long hair, his doctor recommends fixing it in a bun or wearing a hat when you’re around him. They also recommend not turning your back to him to avoid a hair yanking, which could be difficult in a classroom full of students. Between his stints at Pinecrest, Hynes and homebound schooling, the 14-year-old has had a challenging couple of years. plays an educational game in a special-needs classroom at the old McDonogh 35 Senior High School facility. He was still enrolled at Hynes last year when he started getting services in the special room at the old McDonogh 35 school. But Brady was aging out of Hynes. LaFleur had to figure out how to keep him in the room as a high school student. The easy answer seemed to be getting him enrolled in McDonogh 35 Senior High School. Like the room, McDonogh 35 is district-controlled, not a charter. She figured that as a district student, he’d be able to stay there and keep his district-employed teacher. She also liked the new McDonogh 35’s special education accommodations — the rooms are near the main entrance. But in early February, she found out McDonogh 35 wouldn’t accept ninth-graders because the district plans to phase out the school. LaFleur was told to choose another school. She got an email from OneApp, the city’s centralized enrollment lottery, telling her to remove it from her choices. She didn’t. The OneApp team removed it for her. Around the same time, she found out about the renovation plan at the old McDonogh 35 campus. She couldn’t find out whether they were keeping Brady’s room open or relocating it. When she asked, the district assured her that schools have to serve all students, but they wouldn’t answer the question. Asked by The Lens, a district spokeswoman provided a similar response. LaFleur thought about taking legal action to keep it open — but didn’t know what exactly to do. She toured Warren Easton Charter High School, but there were about 15 students in the special education classroom where Brady would be. She thinks that environment would be too much for him to handle. And he’d have to go up stairs — that’s not an option, LaFleur said. “I called Ben Franklin. They said he would have to take the test,” an entrance exam for the school, she said. Lusher told her the same thing. Brady, who’s somewhat verbal, would not be able to pass those tests, LaFleur said. In a last-ditch effort, she again asked if Brady could enter McDonogh 35, since he’d likely be receiving one-on-one instruction anyway. The district again told her no. LaFleur felt like she had no options. In the marketplace of education, schools get state funding for each student. They get more for students with special-education needs, but the funding often doesn’t cover all of their costs. A 2017 study found New Orleans public schools offer fewer pre-kindergarten seats than before Katrina. Researchers think the drop is tied to the cost. Special education comes with similar costs because those students often require a lower teacher-student ratio, like pre-k students, and other specialized services. Brady needs one-on-one care, LaFleur said. The Orleans Parish School Board has taken steps to address the cost of special education students in its charter-dominated school system. The school district approved a per-student funding formula that accounts for the severity of each student’s disability. At the same time, the board lowered the allocation for gifted children. It was a controversial shift because charters that have many gifted students and few students with disabilities, such as Lusher Charter School and Lake Forest Charter School, received less money. On the other hand, schools with more students who need extra help got more. At some schools, between 10 and 20 percent of the students need special education services. Still, there are some students whose educational needs exceed the state funding. Schools can generally cover the needs of students with milder disabilities. But the cost of serving those with more profound needs can easily exceed the additional funding. To close that shortfall, the Orleans Parish school district created the Citywide Exceptional Needs Fund. It provides more money to schools with students whose needs require intensive help. Schools that apply may receive a few thousand dollars to accommodate one student. Some have received more than $100,000. But there’s not enough money to go around. Last school year, schools around the city requested $9.9 million; for the third year year in a row, the district awarded $1.3 million. The district also created the New Orleans Therapeutic Day Program for kindergarten through eighth-grade students diagnosed with the most severe behavioral health disabilities. But Brady couldn’t get into the program because he lacked the verbal communication and social skills necessary for the program, a rejection letter stated. “Because of these limitations, placement at NOTDP would offer Brady little to no benefit and may pose unnecessary risk to his academic and developmental progress,” it read. After the rejection, school district officials suggested three private schools, which LaFleur couldn’t afford, or that she send him back to Pinecrest, which is located in Pineville, 200 miles from New Orleans. The city’s centralized enrollment lottery, called OneApp, doesn’t take disabilities into account when assigning students to schools. It was designed that way so schools couldn’t cherry-pick their students — one of the reasons the lottery system was created. Once students are assigned to a school, the school can look up whether they have an IEP in a state database. But the new school can’t see the details of the plan until the student officially registers. At Crescent City Schools, a three-school charter network, Chief Operating Officer Chris Hines said staffers start registering students for the following school year as soon as they receive an assignment list from OneApp in the spring. That list includes students’ names, grades, the schools they currently attend and contact information. It does not have special education information, because OneApp doesn’t ask for it. Hines said his staff asks students right away. It’s only after officially enrolling a student — typically, mid to late-summer — that a school can review a student’s records to learn if he has an IEP. Hines said that can make it tough for the school to get ready. “It would obviously be great to get specific special ed information about students as soon as possible,” he said. Hines said sharing special education information with receiving schools earlier in the enrollment process is something that’s been discussed across the city. Brady was assigned to Morris Jeff Community School through OneApp in April. School district staff recommended the Mid-City charter school because it is expanding into the Joseph Clark high school facility. District staff told LaFleur they thought there would be space for Brady at the second building. LaFleur immediately contacted the school. She wants to know what Brady’s days will look like there. But things still haven’t been ironed out. Morris Jeff Principal Patricia Perkins has since told LaFleur that the school may not be able to get ground floor space at Clark. An alternative idea was a portable building, but the school said that might not work either. On Tuesday, Perkins told The Lens she couldn’t speak about individual students. She said the school’s agreement with Firstline Schools, which operates Clark, gives the first floor to Clark students. LaFleur expects to hear from Morris Jeff on Thursday.